Towards the end of Jason Goes To Hell: The Final Friday, Jason is dragged to Hell, literally, by numerous hands that surface from underneath the ground. The entire scene is meant to be a climactic ending to Jason Voorhees. In order to accomplish the exciting scene, K.N.B. effects originally set out to design two prop model sets that would depict Jason being attacked by "Tree Demons" and pulled underneath the ground and into Hell. Problems with the prop model sets ultimately led to the production team using only live action techniques for the final sequence, but the two model sets have become something of cult symbols in their own right and much talked about among collectors. The first model set had a model puppet of Jason surrounded by those demon hands, mentioned previously, that surface from underground to pull our favorite anti-hero to Hell. 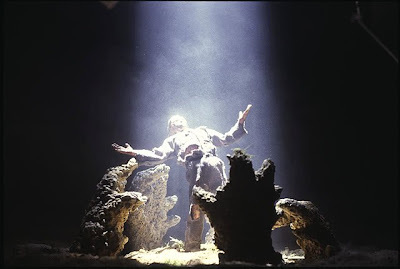 This would ultimately be what viewers would see on screen, but with the use of practical effects rather than the model pictured below. The second model was a more elaborate piece with numerous "tree demons" surrounding a very lively animatronic Jason struggling to elude his would-be captors. This second model set also proved to be troublesome for the production and was also scrapped. After production wrapped on the film, the model sets were sold off, for which one was sent to Planet Hollywood (if memory serves properly) and the other was bought by a collector. This second prop model set was received in very poor shape by the collector and was meticulously restored over the years. The overall size of the model set was much larger than what it is now, with multiple smaller tree demons detached from the model and sold off in auctions (This writer happens to own one of them). So now the second prop model set , restored, and meant to be used for the ending of Jason Goes To Hell, is now up for auction once again with a very hefty price tag. The model has a starting auction price of $4,000 and may likely not find any suitors. If you are interested in the auction for this prop, please visit www.icollector.com for more information! Below is the description of the model prop and below that is the original ending of the film which uses the props mentioned above!.